Hominy comes from white or yellow corn kernels that have been soaked in a mild lye or lime solution until they split and expand. Once cooked, hominy has a fluffier and chewier texture than plain corn and isn't as sweet. Look for the inexpensive kernels in the international foods section of your grocery store. While cooking dried hominy is time-intensive, the cooked kernels can be frozen for later use in soups, stews, casseroles or as a side dish. 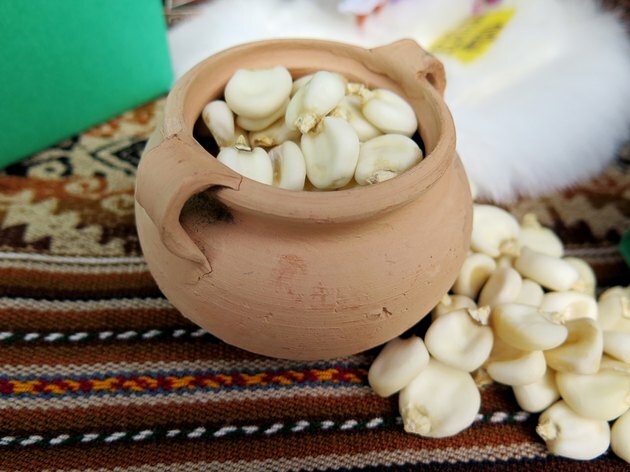 One cup of cooked hominy contains 119 calories, 2 g of protein, 1 g of fat, 24 g of carbohydrates and 4 g of fiber. Measure the desired amount of dried hominy kernels into a large bowl. Cover the kernels with water and soak them overnight in your refrigerator to begin softening them. Drain the hominy into a colander and rinse well. Sift through the kernels with your fingers and pick out any small stones or debris. Transfer the hominy to a large pot and add enough water to cover the kernels by about 3 inches. Bring the water to a boil over high heat. Reduce the heat to medium or medium-low and simmer for two to three hours, or until the kernels begin to burst. Hominy should be soft and slightly chewy when fully cooked. Drain the hominy and serve as-is, add it to your favorite recipes or freeze the hominy for future use. Add cooked hominy to pork and green chile stew to make a simple posole.